Matt Barnes is a contributor to Writers on the Range, the opinion service of High Country News. He works as a research associate specializing in bears with the Northern Rockies Conservation Cooperative, living in his mobile office between western Colorado and western Montana. He is also an Aldo and Estella Leopold Resident with the Leopold Writing Program in Tres Piedras, New Mexico. We can all agree that the recent incident in western Colorado, when a black bear bit a 5-year-old child, and the bear was killed in response, was unfortunate and might have been even more tragic. But I’m a biologist who studies bears, and I want to encourage us to pause and take a wider perspective, one that reduces fear and also allows wild creatures like bears to continue to survive in our midst. Here’s what happened: A bear searching for food wandered into a human community near Grand Junction. A child went outside at night and was bitten and seized by the bear. The mother awoke and screamed at the bear, which dropped the child and fled. The child was badly injured but survived. Wildlife officials from Colorado Parks and Wildlife pursued the bear and killed it. Most of us feel sad for both the child, who was hurt and terrified, and the bear, which was killed, but to blame the bear, the family or the wildlife officials is hardly a helpful response. Black bears are attracted to fruit trees and other signs of human communities, including this backyard apple tree. I would have done the same as any of the people involved. When I was just 5 years old, I wandered into the woods alone and sometimes into danger, but I survived. As a bear conservationist, I’ve chased more bears than I can count out of campgrounds and parking lots, and I can say that, yes, the mother probably saved her daughter’s life by screaming at the bear: Black bears will almost always run away from a human they perceive as aggressive. 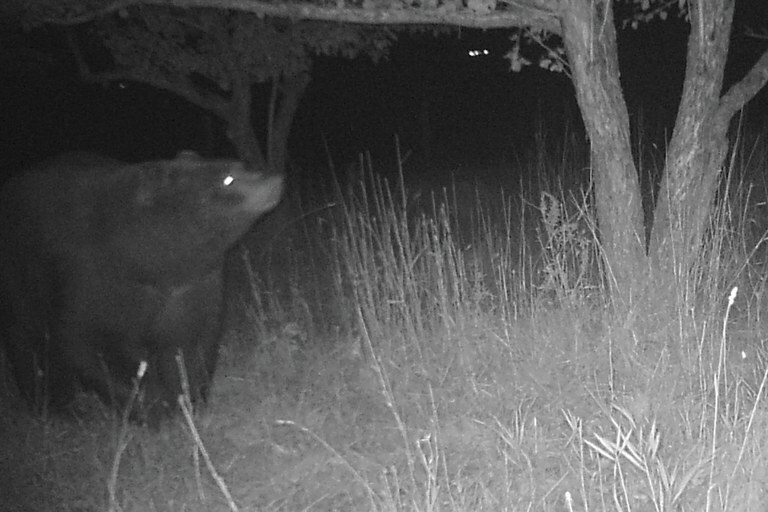 I’ve relocated bears that got food from human sources, but unfortunately, they usually return to the same site where they first got into trouble. Once, I had to kill a bear that became aggressive toward people after it had gotten food from them. It is rare to find a documented event, but black bears have stalked and killed people. But that’s not what happened in Colorado. The recent case fits the more common profile of a human (particularly a very small one) and a bear surprising each other at close range. The bear, in all likelihood, simply reacted out of instinct. Since 2010, in all of North America, there have been only nine fatal black bear attacks, and only three of them occurred south of the Canadian border. In the same time period, there were 11 attacks involving grizzly bears, seven of which were south of the border in Montana and northwestern Wyoming. In almost every case where the bear could be found and identified, the animal was killed. Killing a bear involved in an attack — even if the attack isn’t fatal or can’t be proven to be predatory — is standard practice among wildlife management agencies. It’s not an act of justice; we call it risk management. Bear biologists do not like to kill bears, but we’re almost unanimous that it needs to happen in some cases. Most of those cases are preventable, however. Bears are opportunistic omnivores; their life is all about looking for an easy meal. Ideally, that’s out in the wild, but as our communities sprawl into the wilderness they start to look like a smorgasbord of fruit trees, bird feeders, pet-food bowls, grain bins and trash cans. Especially when wild foods are in short supply, such as in a drought year, bears are attracted to us. We need to look at the bigger picture. These days, there are a lot of us living in bear country, and some of us are even raising fruit trees or backyard chickens. As our communities continue to entice bears, most of us are oblivious to our own involvement. When we leave a dog dish outside, we forget what that means to any wild animal that smells it. We need to think about how we can coexist with wildlife that passes in the night. The larger issue is a philosophical one. Why do we choose to live in the West, especially in the foothills or mountains? We seek out wildness, beauty and connection to the more-than-human world. But when we do that, we are also choosing to accept nature’s risks — including the unlikely but possible dangers posed by carnivorous animals. Personally, I feel much more alive when I know I share the landscape with bears or mountain lions, even recognizing that there is a possibility, however remote, that I might die in an encounter with one. Meanwhile, I know I need to do my part to live responsibly, and in community, with the wild world that surrounds us all. Note: This story has been corrected to reflect that there have been nine fatal black bear attacks in North American since 2010, not 2000.